What is bulletproofing? In terms of high-performance engines, bulletproofing refers to increasing the power handling capacity of an engine beyond the desired power level. Depending on the design of the engine and the magnitude of the power handling increase desired, the bulletproofing process will vary. The parts and processes needed to build a Honda B20 and a Mitsubishi 4G63 to be bulletproof at 700whp are going to be different despite the fact that both engines are 2.0-liter, four cylinders with DOHC 16 valve cylinder heads. Additionally, the process and parts to bulletproof a Toyota 2JZ to support 800whp is going to be different than the parts and processes needed to allow a 2JZ to live a full life at 1,200whp. No two engine designs are created equal. Some are strong, some are weak in stock form. Hence, some engines are going to require more parts, effort and work than others to be bulletproofed at a certain power level. 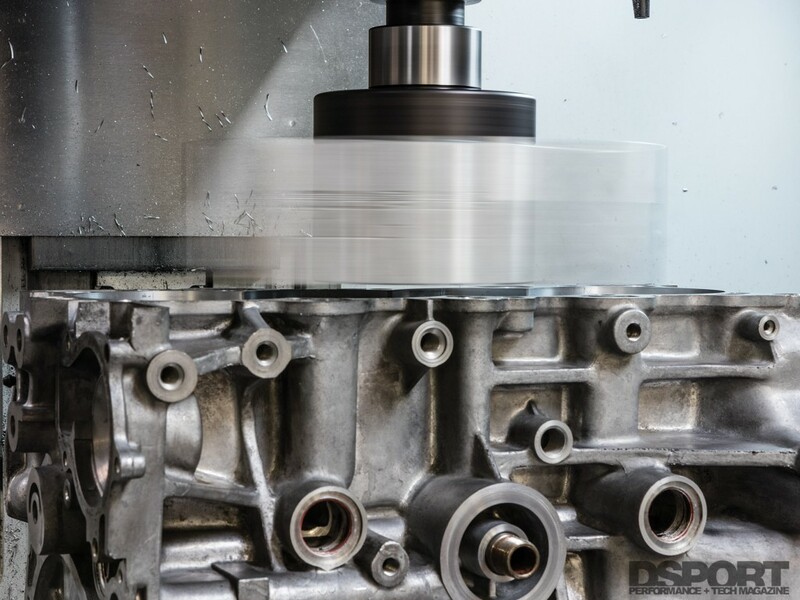 An engine’s cylinder strength, crankshaft support, block-to-head clamping, rotating assembly strength (crank, rods, pistons) and the level of precision of the machine work and assembly ultimately establish the power handling capabilities of the short block. By understanding these five elements, a solid plan to increase the power handling capacity of any engine can be successfully put into action. 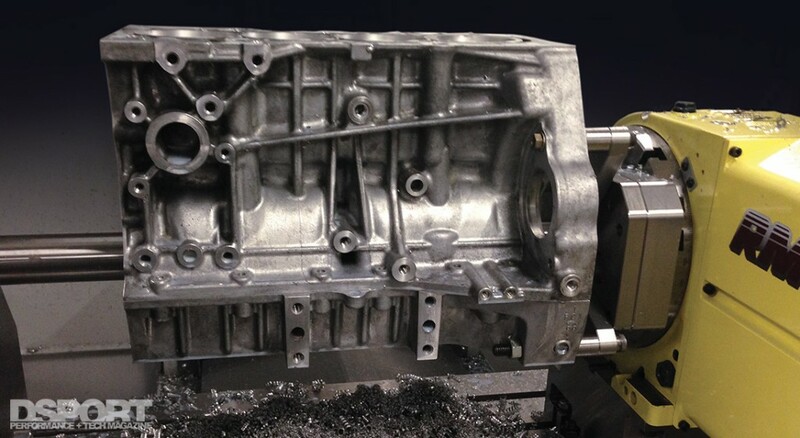 Before the advent of alloy engine blocks, cylinders were cast-in features of the cast-iron engine block. Up until the early 90s, many Japanese OEMs looked to cast- iron blocks for forced-induction performance applications. A number of legendary engines featured cast iron blocks: Toyota’s 2JZ, Nissan’s RB26 and Mitsubishi’s 4G63. On these engines, the wall thickness of the cylinder determined the ultimate strength of the cylinder. Thicker walls have more strength and thus handle higher cylinder pressures. Nissan has offered its RB26 block in three iterations, factory, N1 and GT. The N1 offering thicker walls than the factory-issued block while the GT block offering even thicker walls than the N1. Since there are no such options for most other platforms, sleeving the block with high-strength iron or steel sleeves are required when performance levels exceed the power handling capacity of the factory cast-iron cylinders. 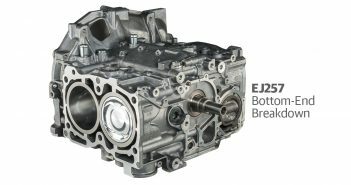 Nearly every engine produced since the mid-90s features an aluminum-alloy block. These blocks incorporate a cast-iron cylinder liner or a plasma-sprayed surface over the aluminum cylinder. The B-series Honda engine was among the first aluminum engine blocks to be pushed hard enough to exceed the power handling capacity of the factory cast-iron sleeve. The extreme cylinder pressures of forced induction would cause the factory sleeves to fail when peak torque output exceeded the 300 ft-lb level. The cure is simple: properly installed, high-quality aftermarket sleeves. 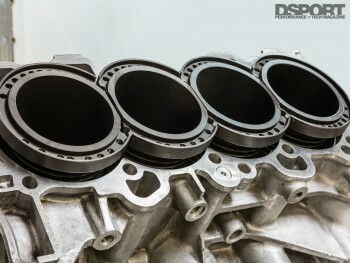 We’ve installed Darton M.I.D sleeves in B-series Hondas and it’s proven to be bulletproof to the 1,100whp level. 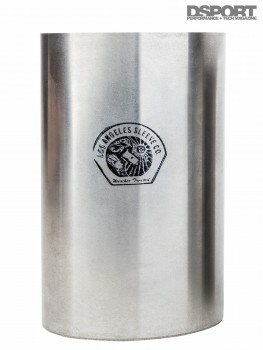 This particular series of sleeve also changes the design of the deck from an open to a closed design which adds support to the top of the cylinders. Darton Sleeves offers its Modular Integrated Deck (M.I.D.) series for a number of popular applicaiions. 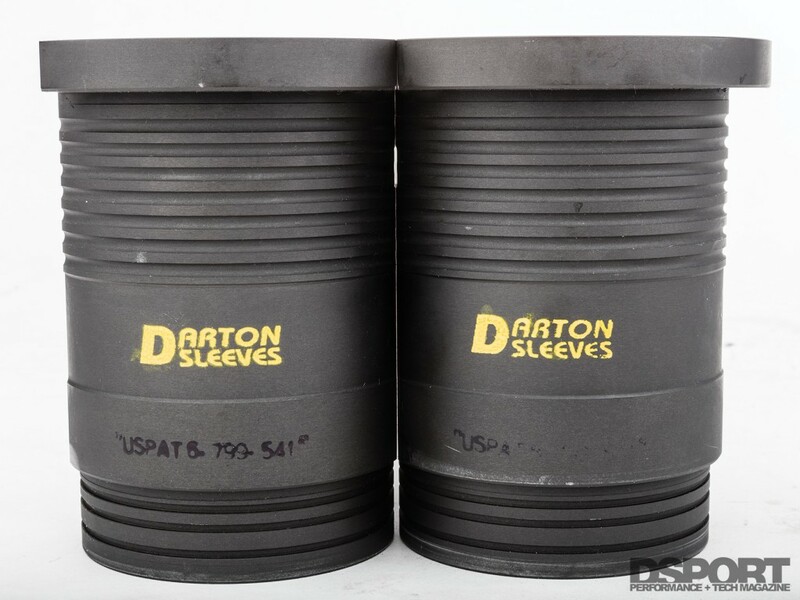 We used these sleeves on the 2.0-liter B-series Hondas that produced over 1,000 whp. Once installed, the Darton Sleeves MID system will transform an open-deck block to what functions as a closed deck. This provides additional stability and strength to the top of the cylinder. There are also a number of high-performance engines that use a plasma-sprayed on surface instead of a thin-wall cast-iron liner. Honda’s H-series and F-series engines, Toyota’s 2ZZ and Nissan’s VR38DETT are some of the more popular performance engines using this technology. In these applications, the strength of the cylinder is solely dependent on the properties of the aluminum alloy and the thickness of the aluminum cylinder walls. The sprayed-on steel surface doesn’t add any real strength. Instead, this surface just serves to provide a wearable surface for the pistons and rings to ride against. Since there are no thicker-cylinder-wall variants of these engines available, sleeving is the only option once the limits of the factory cylinders are found. An engine must be able to properly support the crankshaft to avoid cracking of the block or failure of the main bearings. When an engine is highly loaded in a high- horsepower condition, the crankshaft is undergoing cycles of twisting back and forth. While a properly-fitted harmonic damper helps protect the crankshaft from these stresses, the main caps and bulkheads under the caps are seeing extreme stress. Different types of main cap designs provide different levels of performance. A simple two-bolt main cap design without a girdle (device linking the caps to each other to prevent fore-aft movement) relies entirely on its thickness and material properties for strength. This is one area where Toyota’s 2JZ engine is limited. When power levels above 800whp are planned with this engine, a set of higher-strength, thicker steel main caps should be used in place of the factory cast-iron caps. A Honda B16A block uses five simple two-bolt cast-iron caps to support the crankshaft. Other engines use a girdle from the factory. The Honda B18C versus the Honda B16A provides a good example. The B18C ties its three center caps together with an aluminum girdle that ensures that these caps do not move fore and aft. Honda deemed this necessary when the stroke was increased on the B18C that sees similar RPM levels as the B16A. 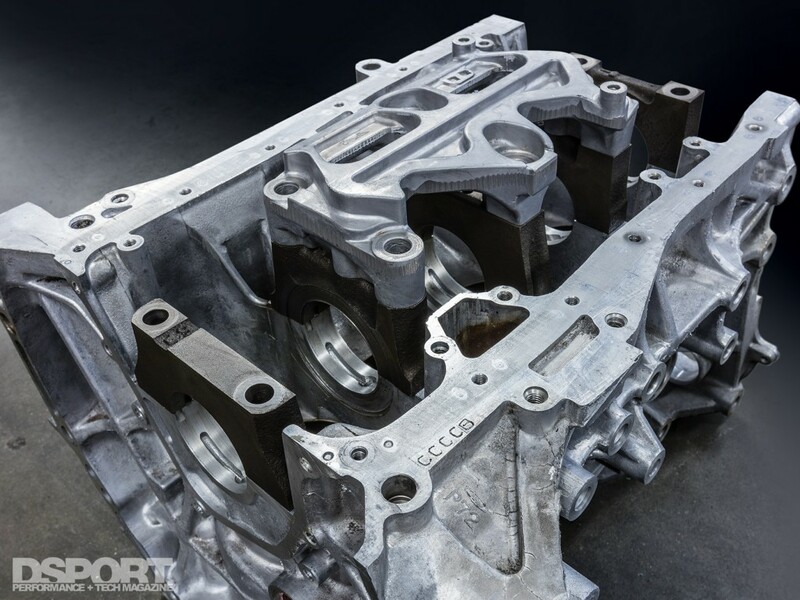 The non-VTEC LS block was designed for lower engine speeds. Although it features a long stroke, its factory-intended RPM level is less, so Honda decided a girdle wasn’t necessary. Mitsubishi’s 4G63 is interesting in that it started life as a two-bolt individual cap engine (6-bolt) only to later be revised with an integral girdle (7-bolt and EVO versions). Kiggly Racing offers a kit to add a girdle to early 6-bolt 4G63 engines. The Honda B18C provides superior crankshaft support (compared to the B16A) by adding a girdle that ties the #2, #3 and #4 main caps together. While girdles are great, there’s an even better design. The highest-strength design involves having main caps and oil pan rails integrated so that the entire lower portion of the engine splits from the top half. The Toyota 2ZZ, Mitsubishi 4B11 and Nissan VR38DETT are a few of the engines that showcase this design. This design strengthens the block and its rigidity ensures that the crankshaft supports stay in place. If you are lucky enough to be building an engine with this type of crankshaft support, it’s unlikely that it will be an issue for any power goal. Nissan’s VR38DETT engine block is one of the newest-generation of engine blocks that provides exceptional crank support. This is thanks to main caps that are integrated with the pan and lower portion of the engine. It’s no secret that import performance fans will often push engines to power levels that are double, triple or even eight times the original level. Some means of forced induction is always involves with power increases of that magnitude. While “boost” seems an easy and effective path to big power gains, these gains come with a similar increase in cylinder pressures. So if a turbo kit doubles the torque and power output of an engine, the cylinder pressures encountered will also double. While some engines have adequate head clamping with the factory head bolts to accommodate this increase in cylinder pressure, most often these higher cylinder pressures overcome the capabilities of the factory head gasket and head bolts. 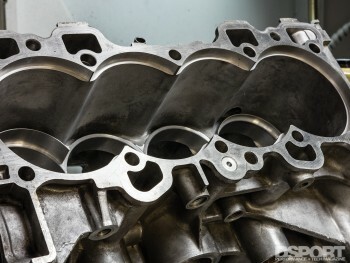 As a result, head gaskets fail and the cylinder head lifts away from the block. To remedy this situation, additional clamping force is needed. To achieve additional clamping force, the aftermarket offers a solution. Higher-strength head studs made of superior materials can general be “torqued” to a higher value. This higher torque value increases the preload or clamping force on the cylinder head. ARP is among the most popular choices for this type of solution. ARP offers head studs in three different alloys: 8740, ARP2000 and Custom Age 625+ (CA625+). Whereas the tensile strength of an OEM head bolt may be in the 150-180Kpsi range, an 8740-alloy fastener will have a tensile strength of 200Kpsi. ARP2000 alloy features an even higher 220Kpsi tensile strength. For applications needing an even stronger alloy, ARP offers CA625+ alloy for select applications. The CA625+ alloy has a tensile strength in the 260-280Kpsi range. When the potential 75-to-85 percent increase in clamping force from the best CA625+ alloy isn’t enough, one can also opt to increase the size of the fastener. 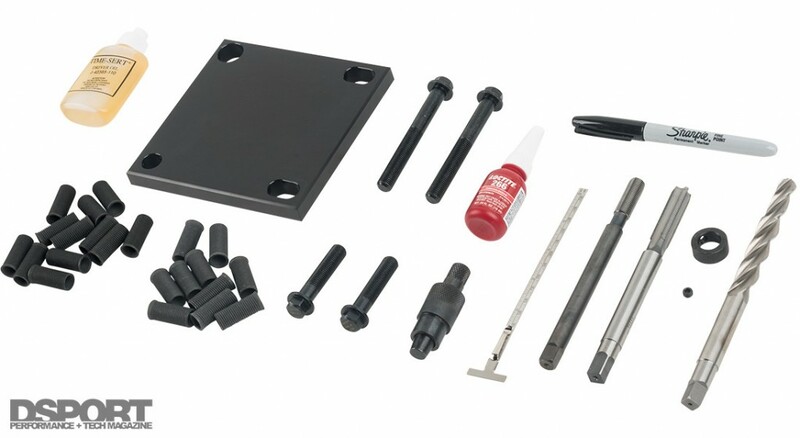 Time-Sert offers a complete M11x1.5 head stud insert kit with the necessary tools and inserts included. Any engine with an M10 head bolt is likely to lack enough clamping force when the torque output of the engine is doubled. One great example of such an engine is the Nissan KA24DE. The stock head bolts torqued to 62 ft-lb with motor oil apply under 10,000 pounds of preload. Push the torque output of this engine past 300 lb-ft of torque and those stock head bolts will have difficulty in maintaining a head gasket seal. When the head bolts are upgraded to ARP 8740 10mm head studs, torque can be increased to 70 ft-lb (using ARP lube). This torque value will deliver over 12,500 pounds of clamping force. This simple upgrade will maintain a head gasket seal even when torque output of the engine approaches the 400 lb-ft range. What if you plan on an even higher torque output from the engine? Then, you will need to consider going to a larger diameter head stud. Moving from a 10mm to 11mm head stud requires the installation of Time- Serts on every head bolt hole on the engine block. While some people just try to retap the block for the 11mm studs without using an insert, this doesn’t provide full-strength in the tap threads. The reason? The major diameter (depth of the cuts) of the original M10 tapping is larger than the minor diameter of the M11(smallest diameter where the threads have been cut). Unless the retapping is identically timed with the original tapping (something nearly impossible to accomplish), a block retapped to M11 from M10 will have a loose fit on the base of the head stud. 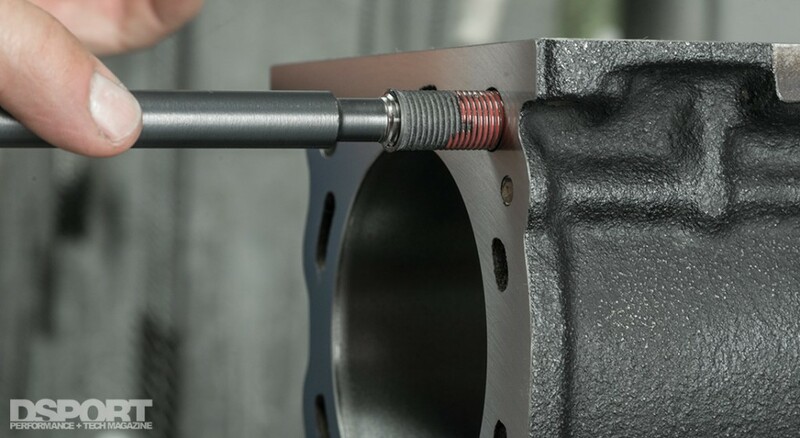 An M11 Time-Sert insert uses a larger drill that completely removes all of the original M10 threads from the block before tapping for a thread size actually larger than M11 for the outside of the thread insert. When a KA24DE has new M11 Time-Serts installed, a set of 11mm 4G63-EVO head studs can be used. These M11 ARP head studs torqued to 80 ft-lb will provide over 13,500 pounds of clamping force. That provides enough additional clamping force for engine torque output in the 435 lb-ft range. When the ARP CA625+ 11mm 4G63-EVO head studs are used, even more clamping force is achieved. These M11 ARP CA625+ head studs torqued to 100 ft-lb will provide over 17,100 pounds of clampingforce. That provides enough additional clamping force for engine torque output in the 550+ lb-ft range. (Top) This is a factory 10mm KA24DE head bolt. (Middle) Here is the ARP 10mm head stud in 8740 alloy for the KA24DE. (Bottom) This is the ARP 11mm CA625+ alloy head stud used for the Mitsubishi 4G63-EVO. With Time- Serts, a KA24DE block can be upgraded to accept the 11mm studs. What about going to a higher torque level with the head studs? 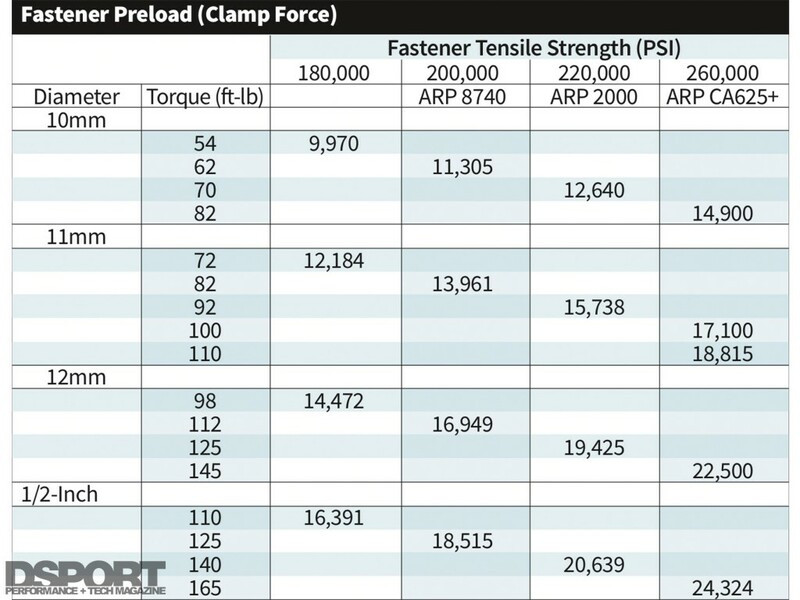 ARP provides its recommended torque values taking into consideration the strength of the threads in the engine block along with the factory preload. In some cases, the fastener may be capable of operation at a higher torque value (usually 10% higher on the 8740 or ARP2000 alloys and possibly up to 20% higher on the CA625+ alloys). However, going beyond the recommended fastener torque values risks failure of the threads in the block. If there is a need to go beyond the recommended torque value, it’s imperative that an angle-torque method be used to establish equal fastener preload. Even when the angle-torque method is used at a recommended fastener torque target, it’s possible to achieve an additional 10 to 15 percent more total clamping force. We’ll outline this process in an upcoming article, so stay tuned for this technique. A precision honing process requires a “honing” or “torque” plate. These plates replicate the distortion of the cylinder once the head is bolted in place. Use the same studs, torque spec and head gasket as final. When the boost is cranked up or the redline is raised, the stresses and strains on the entire rotating assembly are also increased. The factory connecting rod is likely to fail first. This happens on everything from a Honda D16 to a Nissan VR38DETT. Of all of the rotating assembly, the connecting rods have one of the largest challenges. Increases in cylinder pressure increase the compressive forces on the rod while increases in engine speed not only increase the compressive forces at BDC, they also increase the tensile forces as the engine hits TDC. Aftermarket forged connecting rods use superior materials and superior fasteners to survive this abuse. In some cases, an aftermarket rod manufacturer may offer a few different rod designs that are designed to support different power levels. The less massive lighter rods would be optimized for the lower power levels, while the heavier rods would be optimized for the higher power levels. A rod manufacturer may use larger rod bolts or stronger alloy bolts on the higher- horsepower rated rods. The rod bolts are among the most highly stressed components in an engine. 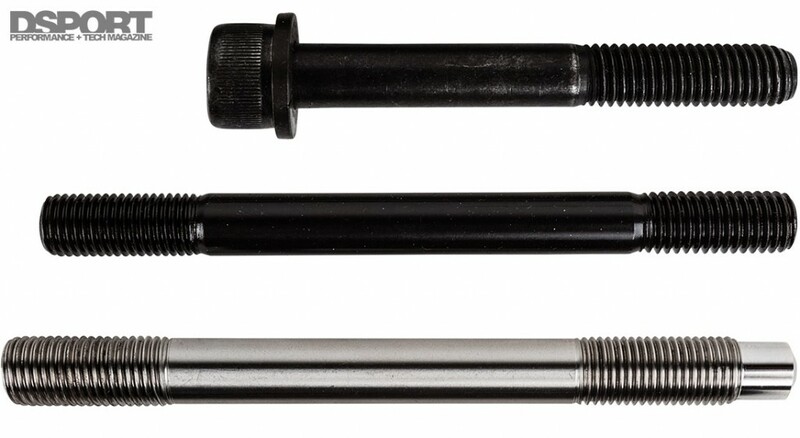 Always get the best quality rod bolts that your budget allows and set the rod bolt preload with a stretch gauge. If rod failure is not encountered first, you can put money on the pistons failing. It’s a long-standing joke that the factory pistons in Subaru EJ engines are cracked when new. In reality, these pistons are simply not strong enough to handle the additional power that can easily be extracted from the EJ engines. 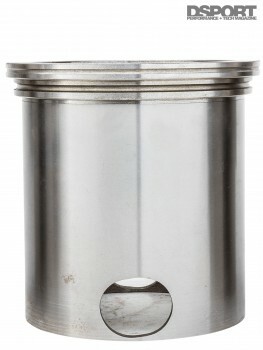 A high-quality, high- strength piston will use a superior-strength material. For most pistons, this is a very-tough 2618-alloy aluminum. The alloy can take a lot of abuse, but it does tend to have a higher rate of expansion than the other popular piston alloy, 4032 aluminum. The 4032-alloy features a higher silicon content. Although this silicon reduces the toughness of the piston, it also reduces the thermal expansion of the piston while providing superior stability over time. 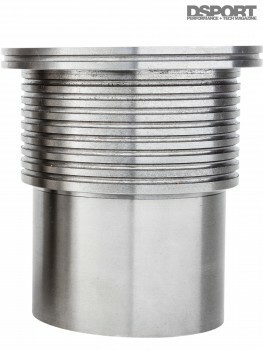 If a 4032-alloy piston will meet the power demands, do not be reluctant to use it. The least likely component in the rotating assembly to fail in most engines is the crankshaft. Modern OEM crankshafts found in Japanese engines are nearly all forged of extremely good material. For example, we’ve made over 1,000whp on a race-prepped Honda LS crankshaft. In most cases, an aftermarket crankshaft isn’t going to be needed to bulletproof an engine. Instead, the aftermarket crankshaft is going to be the right choice when a stroker crank is desired. Aftermarket cranks can also be a great solution when it is impossible to find a factory crankshaft in excellent condition. Displacement, engine speed and cylinder pressure are the three factors that determine the power output of an engine. Increase any of these three without decreasing the other two, and more power will be realized. It’s important to make a proper distinction between power and torque. 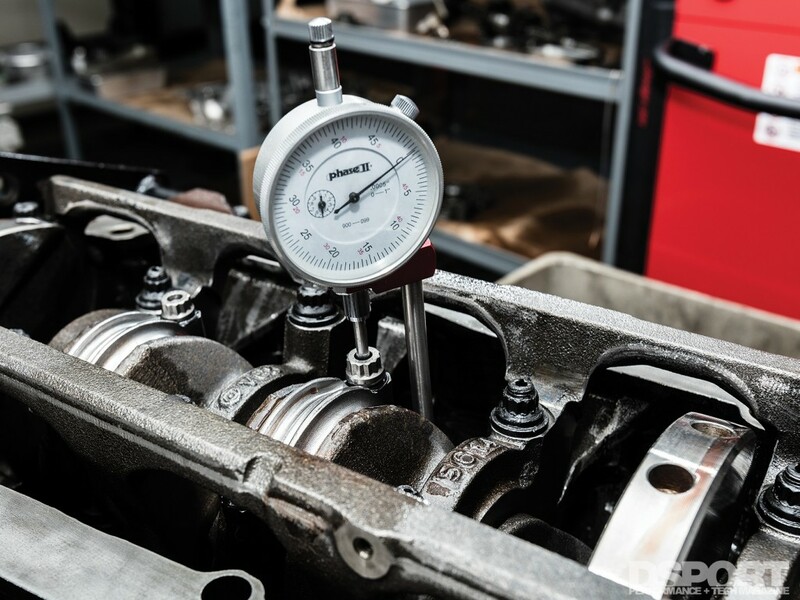 While enthusiasts always prefer to reference power figures, the increase of the specific torque output of an engine is far more indicative of the additional stress on the engine block. While the increase in the peak engine speed (redline) directly plays into the strength of the rotating assembly. The term “specific torque output” is different than torque output in that the “specific” term means that the engine’s displacement is a factor. The specific torque output of an engine is measured in ft-lbs of torque per liter. For a naturally-aspirated engine, generating 100 lb-ft of torque per liter is a very good accomplishment. So let’s say you start with a 2.0-liter engine capable of producing 200 lb-ft of peak torque. If the engine produces this torque at 5,250RPM, it will be making 200 horsepower. If a different engine produces this torque at 7,875RPM, it will be producing 300 horsepower. While the second engine produces 50-percent more power, the peak cylinder pressures between the two engines would be nearly identical (likely a few percent higher in the second engine as additional friction would need to be overcome at the higher RPM). However, if forced induction is added to an engine and the specific torque output is doubled, the peak cylinder pressures will also double. This increase in cylinder pressure is what can cause head fasteners to stretch and cylinders to crack. 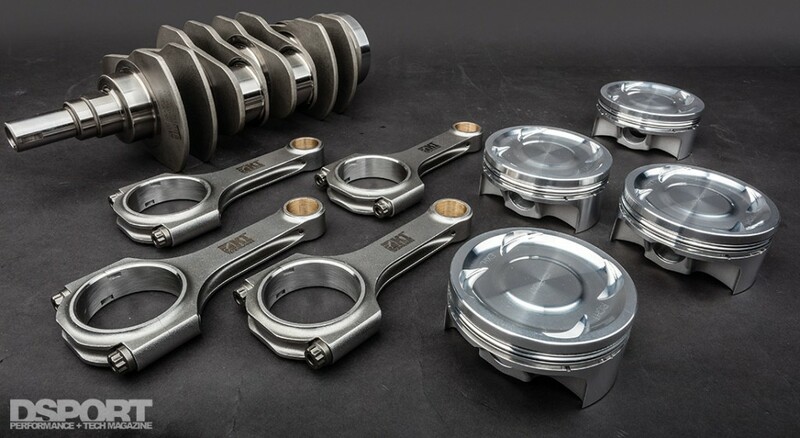 As for increasing the peak engine speeds (redline) of an engine combination to make more power, the additional stresses and strains are mainly bestowed upon the connecting rods, pistons and crankshaft. 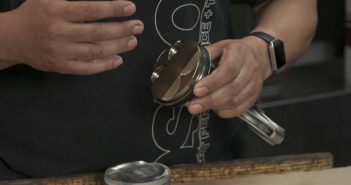 Increasing the redline from 7,000 to 9,000RPM (a 28.6-percent increase) increases the stress on the connecting rod by 65 percent. Precision machine work and proper assembly of an engine are critical to its performance, efficiency and longevity. Cylinders need to be as perfectly round as possible. Decks need to be as flat as possible with a smooth finish. Main journals need to be on the same axis with matched diameters. When the tolerances on bores and the flatness of surfaces can be reduced, then the clearances of the engine can sometimes be safely reduced. While a manufacturer may state a certain tolerance for a crankshaft, the reality is the straighter, the better. A crankshaft with a runoff of 0.001” is going to require 0.0005” more bearing clearance than a crankshaft with half that runout (0.0005”). By setting this clearance on the tighter side with a straighter crankshaft, all of the main bearings are able to support more load. 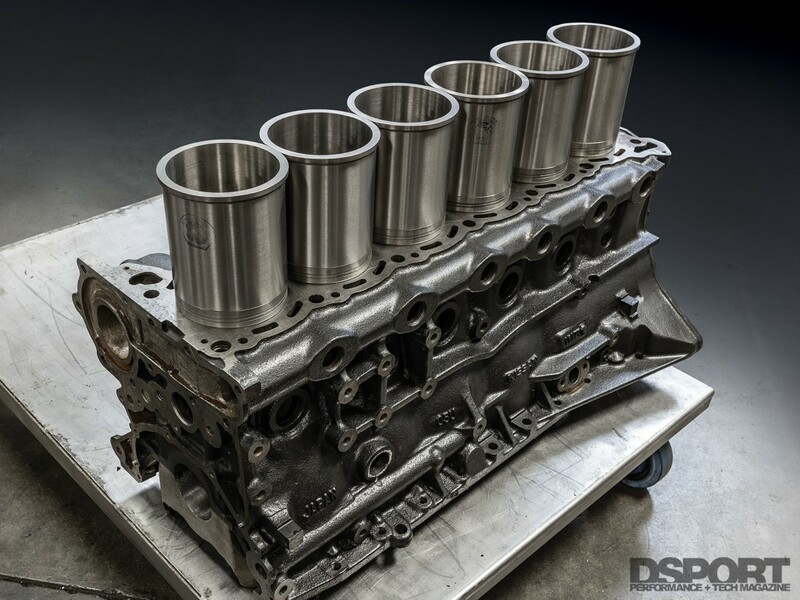 On the high-horsepower builds in our Club DSPORT machine shop, we’ll select a crankshaft with less than 0.001” of runout (preferably under 0.0005”). Then we will precision vertical CNC line bore the engine block. This process also reduces the amount of clearance needed by ensuring that all of the main journals are perfectly centered on the same axis. Some new and used blocks may be as much as 0.0015” from one main journal to another main journal. Most issues with sleeved blocks are the result of improper machining. A CNC mill, the proper tools, the right operator and taking enough time are requirements for a trouble-free installation. Making the cylinder perfectly round, taper free and with a proper finish is the goal of the cylinder honing process. 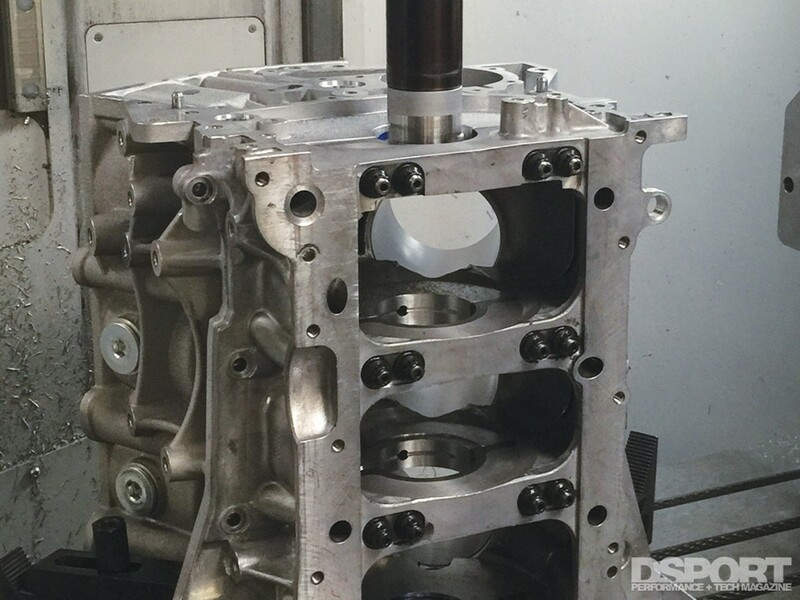 While most machine shops will crank out a 4-cylinder hone in under an hour, we’ve had a four cylinder block in the machine for an entire day to reach the ultimate level of precision possible. Of course, a proper “torque plate” is a must to simulate the exact distortion that will occur once the head is torqued into place. Most OEM manufacturers are able to achieve a very round and taper free bore in the block. However, they don’t use a torque plate in the process. As a result, once the cylinder head is bolted in place, distortion of the cylinder bore occurs. We’ve seen a factory-honed cylinder have nearly 0.002” in taper and a like amount in out of roundness. A precision honing process can get taper and out-of-roundness to 1/10th of that level. These bores are then capable of running at tighter piston-to-bore clearances as the localized tight spots are removed from the cylinder. This allows an engine to run quieter and potentially deliver better ring seal for increased performance and efficiency. 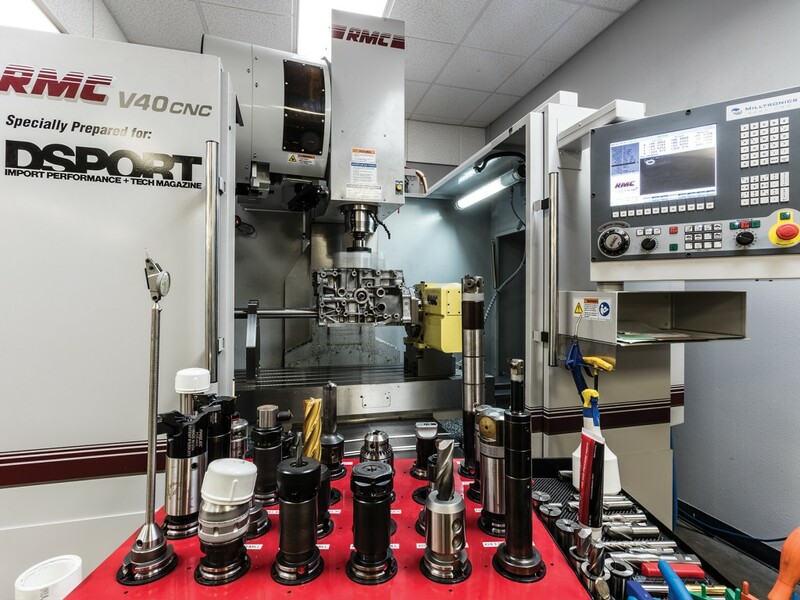 If the machine shop offers a profilometer service too, the finish in each bore can be optimized for superior sealing, cylinder wear and oil consumption. Unfortunately, most machine shops still rely on visual inspection and a non-optimized procedure of X number of strokes with an X-type stone at a certain amount of load. Since the characteristics of the bore material can vary from cylinder to cylinder in the same block, the only way to have a like finish on each cylinder is to measure the finish with a profilometer and to take whatever steps necessary to reach the targets. As for making surfaces flat, surface grinding or lapping is often the best method. Unfortunately, many machine shops do not have the proper equipment to deliver ultra-smooth and ultra-flat surfaces. The cylinder deck surface and the cylinder head will deliver the best seal with a multi-layer-steel (MLS) when as flat and smooth as possible. 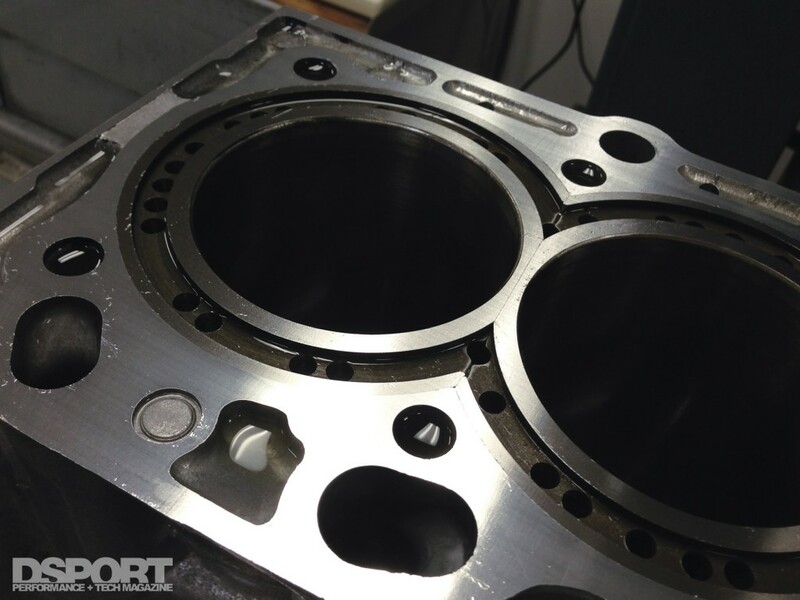 The head gasket seal will also be optimized when an angle-torque method is used. To make a one-run or one-pull engine that hits a big power number isn’t hard. Enough boost, fuel and spark and power will be made. Designing and building an engine to survive at a certain power level during a certain type of usage is a real challenge. The right parts and processes are the key to success. 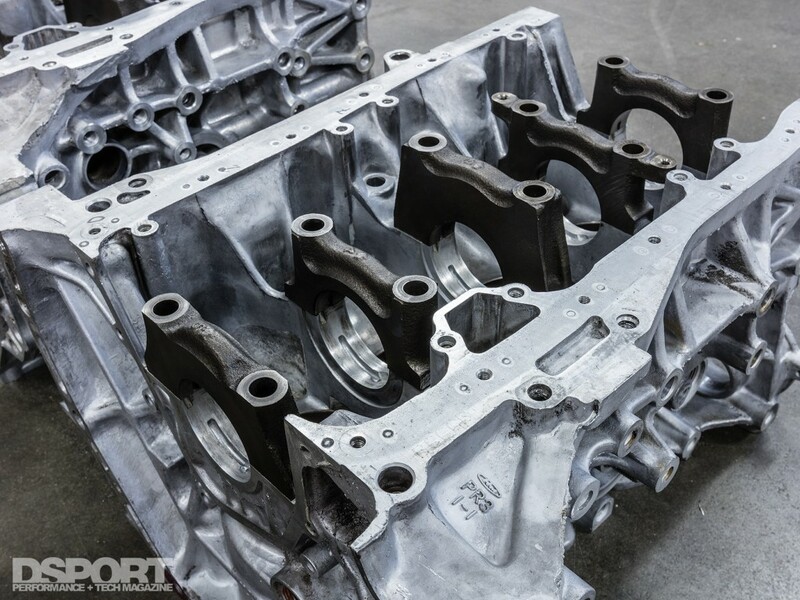 While we now have a great understanding of what it takes to get the bottom of the engine to spec, it only makes sense that we explore the top-end engine upgrades needed to bulletproof the remainder of the engine. Stay tuned.